We fit the adjustable bed massagers into our range of adjustable bed mattresses in our factory. The massage motors are sandwiched between the layers of foam. This means that that you get the full benefit from the massage. Simply adjust the intensity on the adjustable bed massager handset to give either an invigorating massage or nice gentle massage to send you off to sleep. The adjustable bed massager has an automatic timer that will switch it’s self off after approximately fifteen minutes. 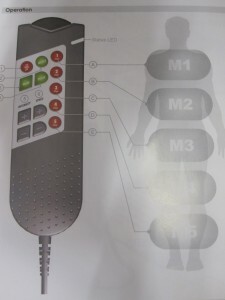 The five adjustable bed massage motors can be selected individually, so if you wish to turn off for example the number one motor in the neck area, highlight the number one button and the press the select button. To re activate the adjustable bed massager number one, simply repeat the process. The same cam be done with each of the five adjustable bed massagers. The wave feature is particularly nice again adjust the intensity on the adjustable bed massager handset to give either an invigorating massage or nice gentle massage to send you off to sleep. You will feel the massage running up and down your back. I mentioned the intensity but the speed that the adjustable bed massagers operate is also important. Myself whilst i am meant to be working selling adjustable beds, who will notice if I have a sneaky five minute rest. The problem is that, put the adjustable bed massager on and it is not until fifteen minutes later that I wake up with customers waiting to try the adjustable beds. I prefer to have the speed that the adjustable bed massagers travel set as slow as possible because I find that more relaxing. To get the maximum benefit from the adjustable bed massager, adjust the adjustable bed so that the back section is slightly raised and the foot section of the adjustable bed is raised enough to put the small of your back in full contact with the adjustable bed mattress. This position is a nice cradled position and with the effect of the adjustable bed massager you will not need to count many sheep before you are off to sleep. Our adjustable bed massagers are fitted inside the mattress, so if you have a memory foam or Reflex foam mattress it can be done. The fitting process of the five adjustable bed massage motors may look a bit of a bodge up, but it works. This can be done by yourself and we can talk you through exactly how to do it. It is a simple case of removing the cover from the adjustable bed mattress. Mark out and put five slits in the underside of the adjustable bed mattress about 75mm deep. Make a small horizontal cut at the 3″ depth on both sides of the slit for the adjustable bed massage motor to sit snugly in place laying flat. We supply a foam adhesive spray to close the slit after inserting the adjustable bed massage motors. Then put a small cut in the underside of the cover and drop the cables through the adjustable bed mechanism slats. connect the two cables to the handset and transformer and you are finished. If you have a sprung mattress, there is an alternative. This is two bigger motors fixed underneath the adjustable bed to the slats. The advantage is that it is simple to fit. The disadvantages are that it is not as beneficial, more expensive and it vibrates the whole bed instead of directing the massage to you. I hope this has been of help. In reply to an online enquiry from a someone who has an existing adjustable bed and wishes to fit an adjustable bed massager. This entry was posted on Thursday, October 7th, 2010 at 1:26 pm	and is filed under Adjustable Bed Accessories. You can follow any responses to this entry through the RSS 2.0 feed. You can leave a response, or trackback from your own site.